Dr. Gene Witiak has been practicing in the Lehigh Valley since 1963. 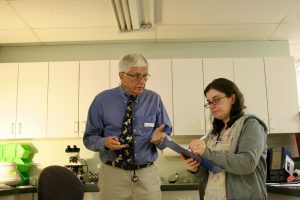 After graduating from the University of Pennsylvania School of Veterinary Medicine, he worked in another practice for several years. 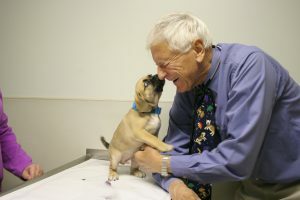 Then in 1969, Dr. Witiak founded Lehigh Valley Animal Hospital in Kuhnsville, with one other employee – his wife Joan! The practice grew, and he opened a second office at his home on Bath Pike north of Bethlehem. In 1997 he sold his former practice to its current owners and worked for them. However, in May 2016 he started anew and is now the joint owner of HanoverView Animal Hospital, in partnership with Dr. Denae Ervin, working with an awesome staff of Certified Veterinary Technicians and Receptionists, who have been with him for a long time. Over the years Dr. Witiak has seen an astounding change in veterinary medicine. Advanced imaging, dentistry, laboratory tests, specialized surgery, to name a few, have had a positive effect on the health of our pets. He is thrilled to be working at HanoverView with his veterinary team and seeing people and their pets that he has known for many years.